Looking to save money and go green? If you’re looking to go green and save money on your electricity bill a hybrid water may be the solution you’ve been looking for. Water heaters are the second most costly appliance in your home to run, your Air Conditioner takes the first prize though. When a hybrid water heater operates in electric mode, it doesn’t save energy or money compared to a conventional unit. In the Phoenix and surrounding Metropolitan as our ambient air temperature is usually high enough for the pump portion to continue creating hot water this is not a problem. Earlier models of hybrid water heaters were found to switch to electrical components at relatively high ambient temperatures. 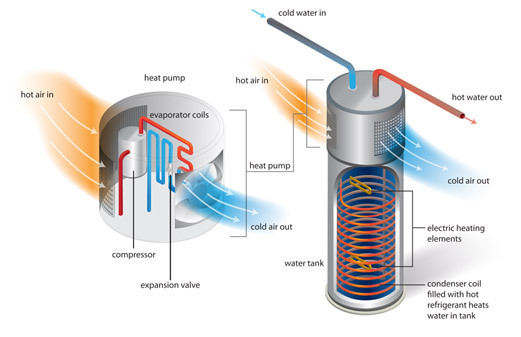 Manufacturers have been working to lower the minimum temperature at which water heaters operate in heat pump mode. Recent models have made significant progress, ensuring the heat pump will continue to operate with ambient temperatures as low as 35 degrees. When considering upgrading to an energy efficient hybrid water heater, dimensions of the new water heater need to be considered. Hybrid water heaters are quite a bit larger than their standard electric counterpart. Water heater sizing will be both wider and taller, so tightly confined spaces may not make the hybrid option ideal for some homeowners. If you are considering upgrading to a hybrid water heater call us to schedule a free no-obligation consultation and get all of your questions answered. With the recent advancements in water heater technology, many homeowners and commercial business owners across Phoenix are switching to hybrid water heaters. As Phoenix’s premier plumbing company, Robins Plumbing, Inc can help you decide whether or not a hybrid water heater will make sense for your space. We specialize in water heater repair and replacement services, and we can help you choose the right tankless electric water heater, electric water heater, tankless gas water heater, or hybrid water heater. Our plumbers are also experienced in drain cleaning, backflow prevention, faucet repair and replacement, and commercial and residential jetting systems. If you’re ready to schedule your plumbing service, contact our plumbers today. We are licensed, bonded and insured experts here to help you with all of your residential plumbing needs. We are licensed, bonded and insured experts here to help you with all of your commercial plumbing needs and we will get your business back up and running.